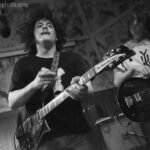 The Districts: The Deaf Institute, Manchester – live review"
The 2013 GIT Awards – shortlist announced…"
Black Pus: All My Relations – album review"
Deeply original and very, slightly disturbing, but most of all, a corker of an album. Arc in Round: Arc in Round – album review"
That being said, Arc in Round is a strong outfit from every corner. The Flaming Lips: The Flaming Lips and Heady Fwends – album review"
This is definitely a record for fans of the Flaming Lips.